The sequel to the funny point-and-click adventure game developed by Daedalic Entertainment. The action of the game takes place on the planet Deponia, which is filled with various garbage. 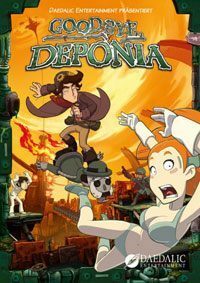 Chaos on Deponia for PC, PS4 and XONE is a classic point ‘n click adventure game, developed by Daedalic Entertainment. The game is a sequel to Deponia and the second chapter in the series. The adventure takes us once again to the planet of Deponia, a world that is basically one big junkyard. As if the life of its inhabitants wasn’t hard enough, the council governing the gigantic flying city of Elysium has decided that the aforementioned landfill is to be destroyed. Rufus, of course, intends to keep that from happening. In order to get to Elysium, the protagonist needs the codes his beloved Goal has locked away inside her head. Alas, the processor, in which they were stored, got damaged on some occasion. Rufus strikes a deal with Doc in the Black Market to perform a surgery on Goal’s brain. The doctor manages to fix the malfunction, but as an unforeseen effect to the procedure, her consciousness is split into three different personalities. Now, the protagonist not only has to save his world, but also regain Goal’s affection, which is not an easy task in her current condition. Much like its predecessor, Chaos on Deponia for PC, PS4 and XONE is a humorous adventure game with a classic point ‘n click interface. The player’s tasks include exploration, gathering items, dialogues with NPCs and solving puzzles. The game also features fully optional mini-games, some of them include arcade elements. Furthermore, the visuals of Chaos of Deponia resemble the previous chapter, which means they are beautiful, hand-drawn backgrounds in HD resolution. The developers have also retained the cartoon style of the previous installment, full of vivid colors and exaggerated character designs. Guide to Chaos on Deponia contains full walkthrough to epic journey. Our guide will help you complete the game and achieve victory. Guide contains many pics to help you find all the items and secrets.